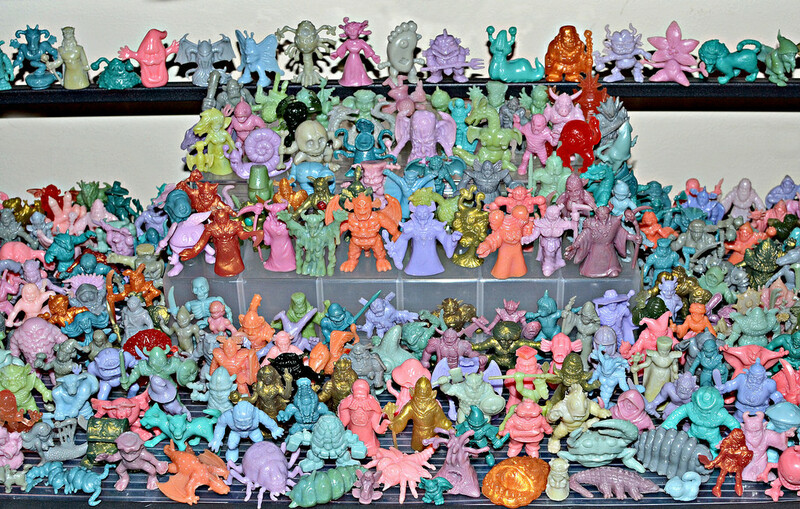 Little Weirdos: Mini figures and other monster toys: Neclos Fortress collection shelf! One of the greatest things about collecting is the feeling that you get when you finally complete a certain toy line or set you've been going after for a while. Some of you might know that I've been trying for a full set of Neclos / Necros Fortress keshi for around two-and-a-half years now, and I was finally able to experience that sweet feeling of completion when I recently scored the last couple of figures I needed! When I first started collecting Neclos I didn't think I'd ever be able to put together a full set. For one, there's 320 different sculpts, making it one of the largest mini figure lines I can think of. Then there's the fact that the line was only available in Japan, making it generally tougher to track down than other popular mono mini lines like Monster in My Pocket and MUSCLE. But early on in collecting I was lucky to score some large lots, so I decided to go for it. Once I got the final few figures, I really wanted to see what the full set would look like displayed together, so I cleared a shelf and spent a couple hours setting up all the figures (not a simple task as some of them don't want to stand). It was totally worth it, though--I think they look awesome together. Sadly I'm not able to leave this display up long-term, but it was fun to do and photograph. It reminds me of why Neclos Fortress is one of my absolute favorite toy lines of all time. So much character variety, fun, unique sculpts, and most importantly, tons of weirdo monsters! What about you? Have you completed any collections you were especially excited about? I'd love to hear about it and see photos! Thanks! I was just hoping they'd all fit and they just barely made it, haha. Wish I could keep them like this. That's really cool. I was super happy when I completed my loose vintage GI Joe ('82-'94) and Star Wars ('77-'83). GIJoe is over 500 figures. Over 500 figures? That sounds like a huge accomplishment. Very cool. Do you display them? Awsome display and awsome site!!! Wow, that's amazing, way to go! I don't think I've ever collected a complete toy line. I've always wanted to, but it's always seemed impossible due to limited time and money. Thats why I've never been much of a completionist when it comes to toy collecting. I've always been happy to mix and match. There are a few collections I would absolutely love to have complete though; like my collection of LEGO Ice Planet 2002 sets. There aren't too many, so it is doable. It would look great displayed on a nice white table and it wouldn't take up too much room I think. I would also love to have a complete set of Mighty Max play sets. 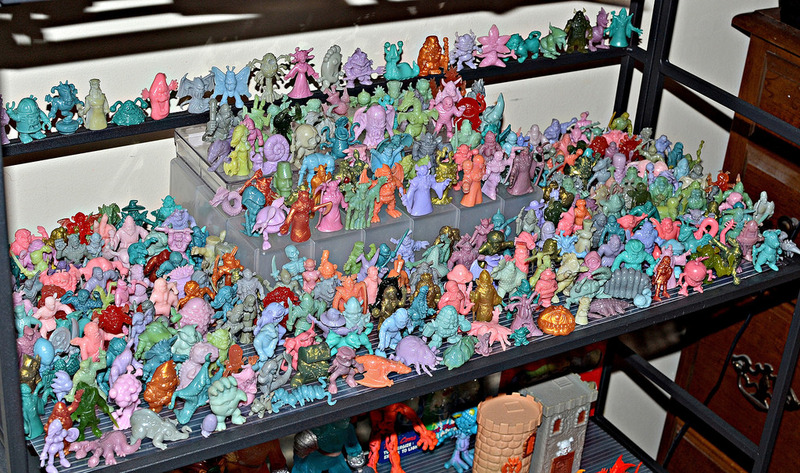 Even with how small Mighty Max sets are, it would still take up a lot of room, another reason I have shied away from fully completing collections. Until I do complete a collection, it's nice to live vicariously through others when they share their collections via the internet. Thank you for that and congratulations! Thanks, Mason! It was a challenge to put together, but a really fun one. Good luck on completing LEGO Ice Planet and Mighty Max, if you decide to go for it. Well done there! I love Neclos things... Only have eight of them myself, and haven't EVER been able to find any more of them - good hunting skills! Can you please tell me, in the second photo we can see two castle towers on the shelf below. I remember these, I got them but don't know what happened to them. What were they? What were the little weirdos who came inside them?